A report prepared and published by the National Bureau For Protecting the Land and Countering Settlements, revealed that the Israeli government approved the construction of 846 units in Jewish settlements in occupied East Jerusalem. The Bureau said that, last week, the Israeli government approved the construction of 130 new units in Gilo settlement, south of Jerusalem, and also started the expansion of a number of settlements north of the city. Furthermore, the Bureau reported that Israel demolished three Palestinian homes in Jerusalem, and forced a resident to demolish his own home. During a press release on Sunday, the National Bureau for Countering Settlements said that the Israeli Authorities in the West Bank are ongoing with their assaults against the residents, and that the army confiscated agriculture equipment in Hebron, prevented the farmers from reaching their lands and demolished a number of wells. Israel insists the Jerusalem is the eternal capital of the country and that “it has the right to build there”. The Israeli government and the Jerusalem Municipality are ongoing with their assaults against the residents in the city and are demolishing their homes while several Palestinian homes were taken over by extremist settlers. In related news, the army informed the residents of al-Ma’sara village, near Bethlehem, that a decision was made to demolish the Ibrahim al-Khalid Mosque and two homes in the village. Shocking description of how Palestinians are deprived of their own water in Palestine/Israel. This segment concentrates on the West Bank. After Brazil’s decision to recognize a Palestinian state within the 1967 borders, the President of Argentina, Cristina Fernandez de Kirchner, confirmed, on Sunday, that she would also recognize an independent Palestine with the same parameters. The announcement was made by a phone call to the Palestinian President Mahmoud Abbas in which Kirchner added that that her recognition was not just a political gesture, but a moral stand. On Monday, the General Secretary of the Palestine Liberation Organization, Yasser Abed Rabbo, said that Argentina’s gesture is a sign that the previous decision made by Brazil has encouraged other Latin American countries and hoped also other countries may add on. After that, Brazil suffered recrimination from the Israeli foreign ministry and several American congressmen, who consider that the Palestinian state cannot be declared unilaterally, but through the Israeli-Palestinian peace talks, which now are on stand by. More than 100 countries have already recognized an independent Palestine within its ’67 borders, including all Arab countries, most African nations and part of the new Asian economic powers, such as China and India. 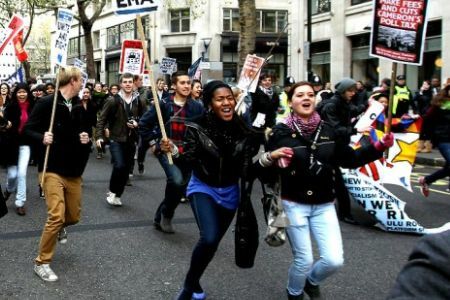 The cities and towns across the UK are bracing for more student protests ahead of a crucial vote in Parliament on plans to increase university tuition fees. The British student groups and university professors have vowed to step up pressure on Members of Parliament (MPs) to vote against any motion that tightens grip on the students and their families, British media reported. The pledge came after the country was rocked with a wave of demonstrations and occupations in recent weeks, some of which flared into violence. A vote on the controversial plan to increase university tuition fees in England and Wales is expected on Thursday, December 9. The new policy on fees will allow universities to double the current tuition fees from £3,290 per year to around £6,000. Some universities will also be allowed to get special approval from the Office For Fair Access (OFFA) to raise their fees to £9,000 per year. If approved, the new fee procedure will be applicable by law from the beginning of the academic year of 2012-13. The University and College Union (UCU) and the National Union of Students (NUS) on Monday announced their plans for the week’s protests in their joint campaign against education cuts. They revealed plans for demonstrations at universities across the country on Wednesday ahead of Thursday’s vote. “These proposals, if they go through, will change the entire landscape of education in this country and we must continue to oppose them. We need to expose the damage they will do to our universities, colleges and communities. MPs must be left in no doubt of the strength of opposition to these plans and the consequences of voting for them. We have been overwhelmed by support from people across the country against these plans and we hope they will all join us in making their voice heard this week,” said UCU general secretary, Sally Hunt. “The joint NUS and UCU march that brought together 50,0000 people on 10 November has provided the spur to a new wave of activism and lobbying, placing the Government’s policy on fees and student support policy under huge pressure. This week we must keep that pressure up as the vote approaches. MPs can be left in no doubt as to the widespread public opposition to these plans or of the consequences of steamrollering them through Parliament,” said NUS President Aaron Porter. Some trade unions are also urging their members to join the protests, maintaining that students are in the front line of opposition to the government’s massive cuts in public spending. “This campaign is very much in the front line of the fight back against the ConDem cuts and has united pensioners, students and trade unionists in an imaginative and co-ordinated coalition of resistance. It has exposed the lies and hypocrisy of the LibDems and has opened up serious cracks in the coalition that we can all drive a wedge into,” said Bob Crow, general secretary of the Rail Maritime and Transport (RMT). “RMT was delighted to have students supporting our picket lines during the last Tube strike and we will make sure that there is a high-profile presence from RMT supporting the students in their action this week,” he said.